Jamaica is a very popular vacation destination known for its beautiful mountain scenery, long stretches of sandy beaches surrounded by a turquoise sea and caressed by gentle waves. The exotic pulsating rhythms of the reggae music and the charm and warmth of the people has attracted visitors for centuries to this tropical playground where the fun seems to never end. Montego Bay (Mo Bay) is Jamaica's second-largest city bustling with excitement views onto the clear of the cool Caribbean Sea. The Donald Sangster airport provides access by air for all of the major international carriers to this wonderful tourist city where many hotels can be found along a 1.5miles (2.4km) strip of coastline. Montego Bay boast some of Jamaica’s beautiful beaches including the Doctor's Cave Beach with its beautiful white sands and sparkling water said to be fed by mineral springs. Additionally there are the Walter Fletcher Beach, the Upper Deck Hotel and the Cornwall Beach Many vacationers travel inland to the restored Rose Hall Great House located on a sugar plantation for a unique Jamaica l vacation travel experience. Once a sleepy fishing village, Ocho Rios is less than 70 miles to the east of Montego Bay on the north cost of Jamaica. Known as the garden-lover's paradise, Ocho Rios is a vibrant tourist destination with international hotels and restaurants. A big tourist attraction is the Dunn's River Falls with crystal clear cascading water falls adjoining luscious botanical gardens with a fascinating variety of exotic plants. Jamaica Travel Tours are also provided to the Shaw Park Botanical Gardens and to the Brimmer Hall and Prospect plantations where sugar, bananas and spices are still grown and harvested. Travel to Ocho Rios should include a drive through the lovely Fern Gully, four mile of winding roads running along a valley, the path of an old river-bed through a variety of ferns. Negril, on the western end of Jamaica is a famous seven mile strip of beach with hotels, restaurants, clubs and cottages. For years, Negril's has been rated as one of the top ten beaches in the world by many vacation travel magazines. Negril offers sailing, water-skiing, deep-sea fishing, scuba diving, parasailing and windsurfing. At this popular holiday vacation travel destination, Jamaicans sell a variety of craft goods from the many shack shops in Negril. It is a place with an easy going atmosphere where you can soak in pristine waters, swim, sail or scuba dive over coral reefs or feast on snapper and lobster, conch soup or Irish moss. Rick's Cafe is a great place to watch the cliff jumpers with jumping points reaching more than 40 feet high. Port Antonio is located about 100 km from Kingston and is considered one of the Caribbean's most beautiful bays and tourist attractions. 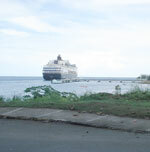 Port Antonio offers rafting on the Rio Grande river on bamboo rafts, which sail past bananas and sugar cane plantations. Port Antonio is also famous for the spicy hot Jamaican Jerk Pork and one of the finest coves in the Caribbean, the Blue Lagoon, a salt-water cove offering fishing, swimming and water-skiing. Port Antonio has been featured as paradise in many Hollywood movies such as "Club Paradise" and "Cocktail" and the late movie star Errol Flynn bought nearby Navy Island and made it his home. 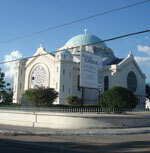 Kingston, the capital of Jamaica, is the island largest city and also its cultural center. With the seventh-largest natural harbor in the world and the largest in the Caribbean, Kingston is an industrial center with a mix of Georgian architecture and modern construction. A vacation travel to Kingston offers many attractions including the Bob Marley Museum, The National Gallery of Art, the Hellshire and Lime Cay beaches and the Hope Botanical Gardens with a variety of trees and plants. Other sites include the Arts and Crafts Market on King Street, the White Marl Arawak Museum with artifacts and relics of the ancient culture of the Arawak Indians and the Caymanas Park racetrack, where you can bet on the horses every Wednesday and Saturday. Kingston is served by Norman Manley International Airport and also by the smaller and primarily domestic .